Welcome to The Xcceleration Station at 8440 Santa Monica Blvd. We have two studios to maximize all our services, ‘Ground Level’ and ‘Cloud Level’. 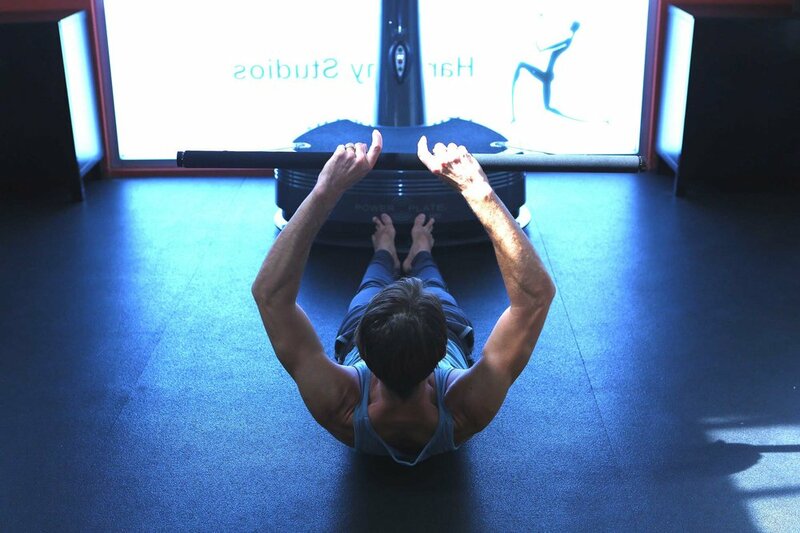 Ground Level (pictured above and to the right) is located inside of Harmony Studios Pilates, to your immediate left upon entering the building. 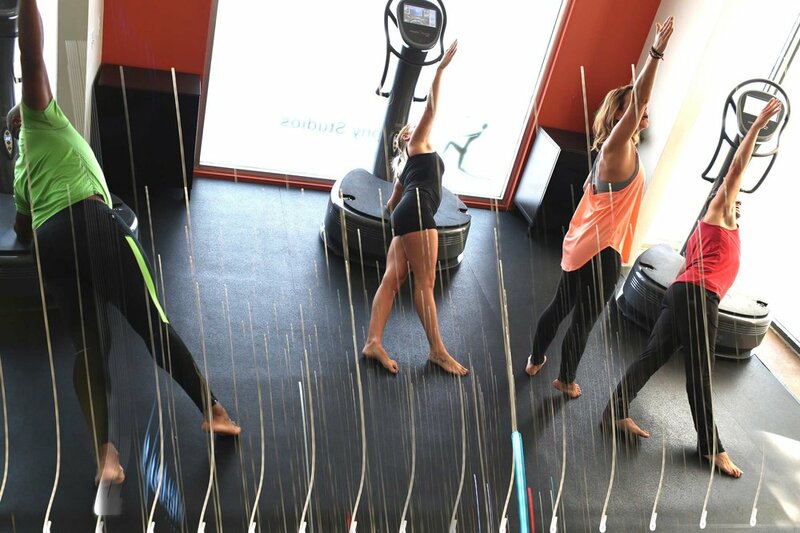 This studio is home to our Power Plate station and is where all group and one on one plate appointments happen. 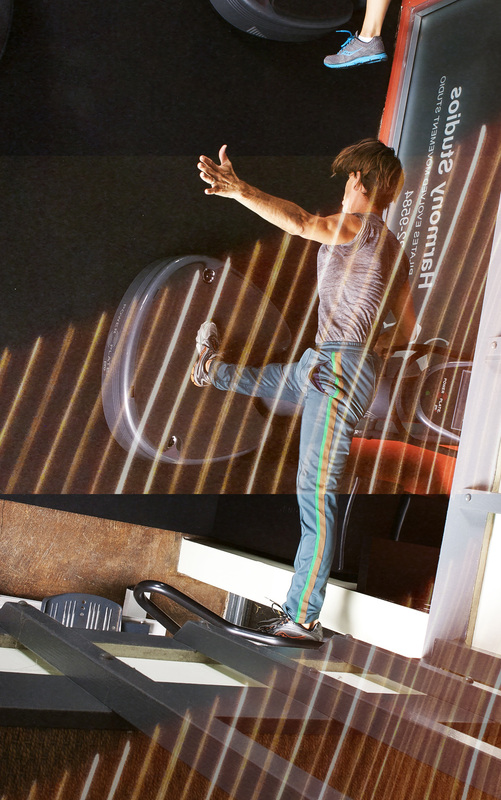 Enjoy the view of one of the busiest and friendliest streets in LA while experiencing your Power Plate session. Cloud Level (see video below) is located upstairs in Suite 203 and is accessed by the building's main staircase after entering the lobby. At the top of the staircase, turn right and Suite 203 will be to your right. This studio is home to all our Xccelerate your Mind and Life sessions as well as BioDensity, Foundation Training, X3Bar and Xccelerated Stretching classes. Our Cloud Level studio is home to the first official Waff Studio in the U.S. and Los Angeles. The Xcceleration Station's Cloud level studio is available for rental for your own events, workshops, meetings or classes. Cloud Level has two joined spaces that may be rented separately or together, by the hour or by the day. In addition to the desirable West Hollywood location, the exceptional natural light and open floor plan of the studio makes it a perfect location for so many gatherings. Read below or view our PDF deck. Our terms and conditions are also available here so that you can make your arrangements with us easily. If you have any questions, please don't hesitate to contact us. Welcome to The Xcceleration Station located in the heart of West Hollywood, the center of greater Los Angeles. You'll find us on the south side of one of the largest arteries in the city, Santa Monica Blvd. One street south of world famous Sunset Blvd and only minutes away from some of the most visited sites in LA, including Beverly Hills, Rodeo Drive, Sunset Strip, Melrose Ave., and the newly re-designed Beverly Center. Our building is known in the area as simply '8440', an off-white mid-century building with a single lavender wall facing Santa Monica Blvd with a large plate window displaying our Power Plate training area and a brushed silver backlit sign ‘Harmony Studios/PILATES’. The address, '8440' will be over the entry door as well as facing east bound traffic. There is a blade sign on the front of building, viewable from the sidewalk and the eastbound side of the street that lists our studio services ‘Pilates, Gyrotonic, Power Plate, Foundation Training, Group Classes’. You will not see any visible signs for The Xcceleration Station on the building however '8440' is the correct place. For event or appointment parking there is 2 hour metered parking directly in front of the studio on Santa Monica Blvd and two hour parking on our side streets - Croft and Alfred (see signs for restrictions). For longer presentations or day events, the easiest uninterrupted parking is a public lot two streets east of us, on the corner of Santa Monica Blvd and Kings Road. The walk to our studio from there is less than 5 minutes. Upon entering the building from Santa Monica Blvd. move directly through the lobby, head up the staircase to the second floor. At the top of the stairs turn right and move to the solid white door marked “The Xcceleration Station”, Suite 203. We will be there to welcome you. The studio consists of 2 adjoining rooms (in an ‘L’ shape configuration), with carpeted floors, floor to ceiling windows, and a mirrored wall - totaling 565 square feet (refer to floor plan for details) - plus a wonderful outdoor patio and a front office. The unobstructed rooms (no columns) and 9 foot ceilings produce a vastness/openness effect. The large windows provide exceptional natural light as well as a soothing view, creating a peaceful, sanctuary-like feeling. *Overhead fluorescent lighting is also available if more light is needed. The space can very comfortably accommodate 16 people on mats (8 per room), and up to 24 (12 per room) if you don’t mind the mats being closer together. Or 40-50 people seated on chairs (20-25 per room). Perfect for your next presentation, class or meeting. You are invited to bring light snacks and beverages during events, however we do not provide refrigeration or heating options. We are partnered with Kona Deep and have that water available for purchase if you prefer. You are welcome to use our mats (10) and cushions (3 large + 3 small) for your event, as well as our wireless speakers (for music/audio) and our WIFI connection. We are also happy to provide up to 10 metal chairs and 2 folding tables (6’ long) at no extra charge. Massage tables (2) are available for a daily rental fee. The space has heat as well as air conditioning, but we do not have a landline so please be prepared to use a cell phone for communication needs. Restrooms (2) are located just outside the studio in the upstairs lobby area. Feel free to contact our studio directly at any time via email: Email TXS or by phone/text 323-310-0550. The fee for one studio (A or B) is $35/hour. To rent both rooms together, the fee is: $60/hour. The entire space is available to rent (private event/meeting) for the daily rate of $500. Cleaning fee for daily rentals is $35. Detailed information regarding fees and payment is included in the contract. West Hollywood exemplifies LA's reputation for healthy and delicious food with more than 20 restaurants, juicery options, coffee shops and grocery stores, all within a 5 minute walk. Arrive early and stay after for some delicious food. Earth Bar - healthy juices, to-go sandwiches, salads, ect. Niko Niko Sushi - reliably good sushi. Not the sushi to change your life but good. Palihouse - Mardi Gras and Rooftop bar. Across the street with fantastic views of WeHo and LA. And many more on Sunset, La Cienega, Melrose and other nearby streets. Caroline began her exploration of bodywork by becoming a certified massage therapist in 1989. In 1991, she was introduced to the unique training methods of Pilates and Gyrotonic Expansion System as she began her professional dance career. She is a founding member of the international touring dance company Tongue. She holds certifications in Pilates through Long Beach Dance Conditioning and BASI, is certified in the Gyrotonic Expansion System® and Gyrokinesis™, and is an official pre-trainer of the Gyrotonic Tower and Handle Unit. She has studied Ashtanga yoga with Tim Miller, certified with Erich Shiffmann in Hatha Yoga and is loving her current practice with Anthony Benenati at City Yoga. Caroline is certified as a personal trainer through National Academy of Sports Medicine and is currently studying for Integrated Flexibility Specialist. 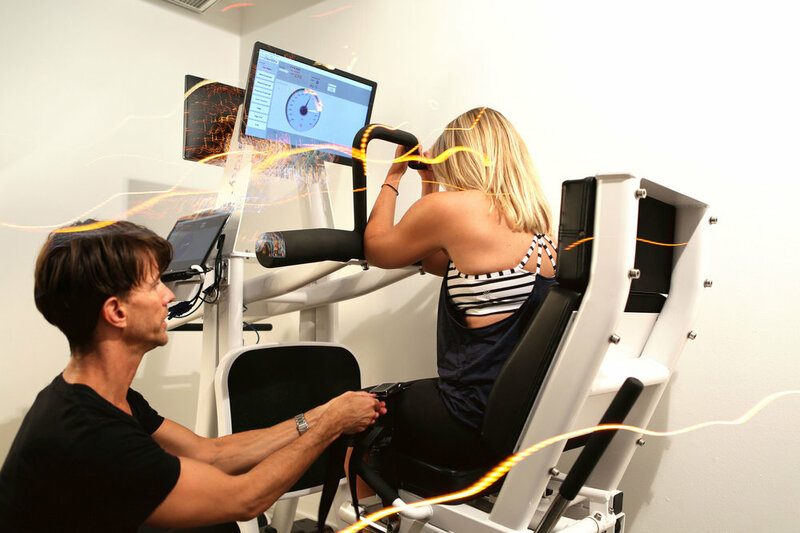 Through her years of study, Caroline has a developed a deep personal understanding of what it means to unify strength and flexibility; consciousness and instinct; and to have a functional, intelligent body. She has been featured on KTLA news, Extra TV, and voted by Hollywood Reporter as one of the top 20 luxuries that women in the entertainment industry can't live without. All things social media. Follow, like and share with us. Reviews from clients in their own words. 'You're bone on bone; a hip replacement is in your future.' 'There's no movement, the leg is stuck. I think you should have the surgery.' Was this my future at 50 years old? Yep, it was. Not good. What is good.... I didn't listen to them. I called- immediately he called right back! Off to a great start! I set a date, took my first class and immediately signed up for 18 sessions on the spot! I've found my salvation. I fondly refer to him as "Vibro-Man", my superhero! Most folks call him Chad, but whatever the name, because of his knowledge and the power of the Power Plate, I am on the path to a normal life. I don't have to wonder if it was worth my money. I'm walking proof that it is. In my 50's, I started seeing Chad for quantum biofeedback as part of my quest to feel better than I did, to stop or slow down my body's breaking down. It has been an incredible journey. I've been weened off three medications I thought I would have to take for the rest of my life. I feel good all day and have developed an awareness of what my body is telling me. I had two Reconnection Healing® sessions w/ Chad. I had been going through a rough time more on the emotional tip at that point and you could say it was my 'focus' of sorts. It was however, my understanding that you would get the healing you needed. I like that, how it takes the pressure and responsibility off my shoulders. Which, interestingly enough is one of the things I experienced. I've had shoulder issues for the last couple years and was reminded of that when the right shoulder down to my fingertips 'lit up' on fire(figuratively). I'm used to just dealing w/ it and the pain on my right side had been gaining some momentum again. That, thankfully has been receding since our session. I would like to mention awareness and thoughtful choices regarding balance and pressure I use w/ my shoulders has been consistently more mindful since our session as well. Chad Allen has been working with me for nearly a year. He has treated both me and my daughter and son. I have no idea how he does what he does but I do know that the effects are profound and sometimes almost unnerving. I find it quite amazing that Chad can diagnose an issue before it has even happened and treat accurately ailments that doctors are unable to even recognize. Being a skeptic at heart, yet trusting Chad, I chose to have a Reconnective Healing® session to deal with a recent trauma to my shoulder, an injury that left my shoulder and arm practically immobile. Through his gentle guidance and reassurance I was able to let go of any expectation and to experience the feeling of the energy. Immediately I felt grounded to the table. I’m not sure if I could have sat up even if I wanted to in that moment. I also noticed a prickly, tingling sensation; one just above my lip and the other behind my right ear. A feeling like no other I have ever felt was the wave like energy I felt all over my body. It was as if an oscillating fan was blowing, not just on me but through me. The most amazing feeling was that immediately after the healing session I was able to put weight on my arm for the first time in months without any pain! I‘m still not sure how it all works, I just know from personal experience that it does. Thank you for ALL that you do! Without any exaggeration, your Foundation Training class is changing my life. I'm 29 and have had lower back pain off and on for the past ten years. I've gone to physical therapists, acupuncturists and chiropractors - and have heard many diagnosis - short hamstrings, SI irritation, degenerative spine... you name it. It all helps a little but the pain comes back. Nothing has helped as much as Foundation Training. People like me who live in pretty constant physical pain know that it messes with every aspect of your life. Last week I was in almost zero pain for the entire week. In my life - that is pretty much unheard of. I also really appreciate the meditative aspect that you personally bring to the Foundation Training practice, changing your body is as mental as it is physical. I started doing Power Plate workouts 2 months ago. I usually only have time to fit one or two 30 minute workouts in each week. I have participated in athletic activities all of my life and have had my share of sports injuries. As I got older, with less time available for activity, my hips, knees and low back began to bother me and become stiff. I tried yoga, stretching, chiropractic and acupuncture to try to alleviate the stiffness and pain. I would get a little relief but when I returned to other physical activities such as hiking or golfing, my muscles would stiffen and my joints would begin to ache. I chalked it up to getting older and continued to work around my limitations. Thanks for being available to help me calm down my allergies to my building's paint fumes and construction dust in time for my concert at the Colburn School. Having too adverse reactions to allergy drugs, I have resorted to holistic health options for my wellness. That was a miserable week of difficult breathing and I can't imagine what I would do for my singing without your quantum healing sessions. 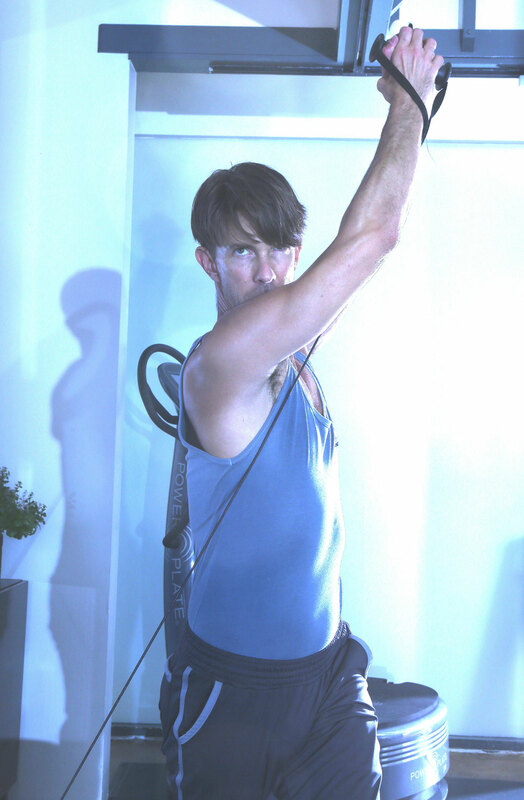 I feel stronger, more flexible, and have better balance since training on the Power Plate. Thank you Chad for introducing me to this marvelous technology and guiding me every step of the way in my training. I can't tell you how much I rely on your expertise. You seem to always know how to fix what is ailing me. I know we were both very excited about my latest bone density results. Hopefully, I will have an even better report next year, as my training progresses. Thanks again Chad. I really didn't know what to expect when I went for my Reconnective Healing® session, but I was curious and fascinated by what I had heard about it. The session itself was very pleasant. I had different sensations of tingling and heat, but it was so relaxing that I kept drifting away. Not to sleep, but just away. Afterwards I felt great. Generally euphoric as if all was right in my world. I had had several issues with my hand and arm, and after the session I was really feeling it. It was like a pulsing sensation. I had to go to work, and I forgot about it, and when I thought about it later it was because I wasn't feeling any pain there at all. The most interesting thing about the session was very unexpected for me. For all my life I have felt like I lived in a different temperature zone than everyone else. I'm the guy who is in a t-shirt and shorts while everyone else is bundled up for the cold. Conversely, when it's hot out I feel like I'm roasting alive. After my session I felt the December cold. It was bizarre, but very cool. (Pun intended!). Since most people heat their houses and cars to their comfort level, I have always been uncomfortable. It's so nice to feel normal, as I assume everyone else to perceive it. I can't wait for my next session.